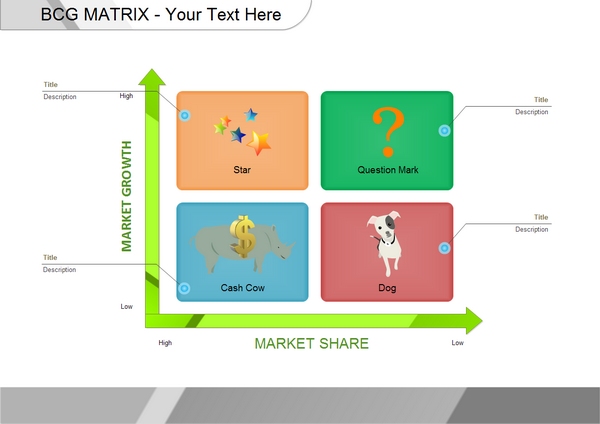 An example BCG Matrix, help analyze the performance of products by growth and market share. Below is a sample BCG Matrix which can help to analyze the performance of products by growth and market share. Sample bcg matrix example drawn with the Edraw BCG matrix maker. You can download and modify these BCG matrix for your own use. This template can reduce the amount of time to create great BCG matrix by using built-in symbols right next to the canvas. Click here to free download Edraw Charting Software. Then you can use the built-in templates to create and present BCG matrix in minutes.